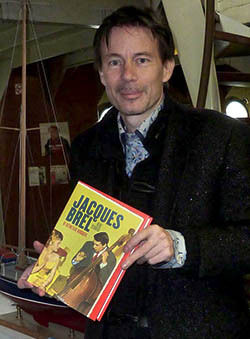 The presentation of René Seghers' Dutch language book 'Jacques Brel De Definitieve Biografie' took place on 11 AM, Thursday, September 27, 2012, at the light boat 'Westhinder', which is docked at the Skilt quay in Rupelmonde, Belgium. Gathered there together were a number of journalists, and some famous Brel interpreters, such as Belgian legend Will Ferdy, John De Wilde from legendary Belgian band De Strangers, Gert Torck (whose 1999 Brel album was 'forbidden'), and German singer Maegie Koreen (featured twice in the complete Brel cover recitals list), who came over especially from Germany! The presentation was offered to publishers Tirion (NL) & Houtekiet (BE) by the community of Kruibeke, of which Rupelmonde is part. 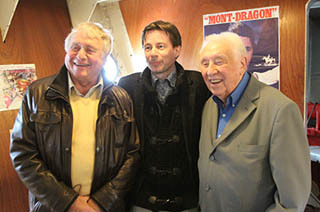 The Mayor of Kruibeke, the celebrated Antoine Denert, opened the program by welcoming the guests and explaining also why Kruibeke has now a special bond with Brel: because it is here, at De Nieuwe Scheldewerven, where Brel's boat The Askoy II found refuge (an interview with owner of the Nieuwe Scheldewerven Peter Janssens on his motivation can be found on both the Askoy page, and in the videography). Apart from the restoration project, Brel also meant something to the Mayor in person, who stipulated that he personally loved the language of Molière, which was the one in Brel expressed himself most often. I would like to say here that Brel is to the Flemish what this or that artist is to the Dutch, but unfortunately, there is no such comparison possible, since we don't have a Dutch equivalent. Neither does the USA, or the UK. Admittedly, there are singers of stature in these countries, but the difference is that there are numerous legends there, whereas there is only one such a legend in Belgium. Does France have a similar figure? Yes and no... it depends if you judge by nationality or by the use of French as language. In the last case, they have such a figure: Brel! 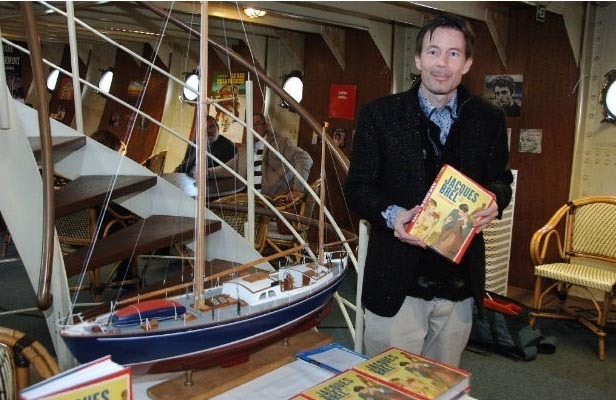 With respect to the important part of the Askoy II in 'Jacques Brel De Definitieve Biografie', the saviour of the boat, Piet Wittevrongel referred to his motivation, and his meeting with the author. Their mutual fascination for the boat led to Piet handing over his entire archive to Seghers, and helping with establishing contacts with previous owners of the boat throughout the decades. It is this research that made the reconstruction in words and images that is featured in 'Jacques Brel De Defintieve' possible. Finally, those present walked to the shipyard, for an inspection of the progress made with restoring the Askoy to its former splendour! An emotional moment for many, including Will Ferdy. His career start had coincided with Brel's. In fact, they had been friends since they became last and forelast in a singing contest in the early fifties, before they both made their careers.